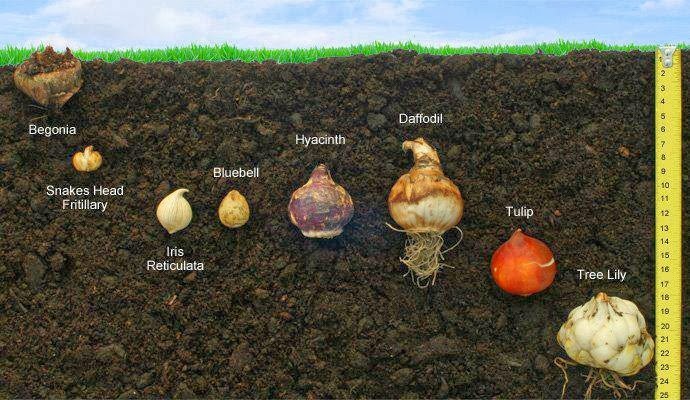 Well its that time of year again, time to start thinking about planting your bulbs for spring. I found this grate picture that shows planting the depth for the most popular flower bulbs. A nice tip is to plant a few of them upside down. They will still come up (unlike my grandmother always told me) but it will take them a few days longer to come up then the ones planted right side up. Doing this will give you a few extra days of bloom. Another nice trick is to plant several types of bulbs on top of each other in the same pot. Some bulbs come up later then others, this will extend the flowering life of your pot. The ones that come up at the same time will give you a really pretty display, when they flower together.